Listen up, fans of Radiolab, Invisibilia, and Reply All: Your favorite podcasts are coming to theaters for one night only. 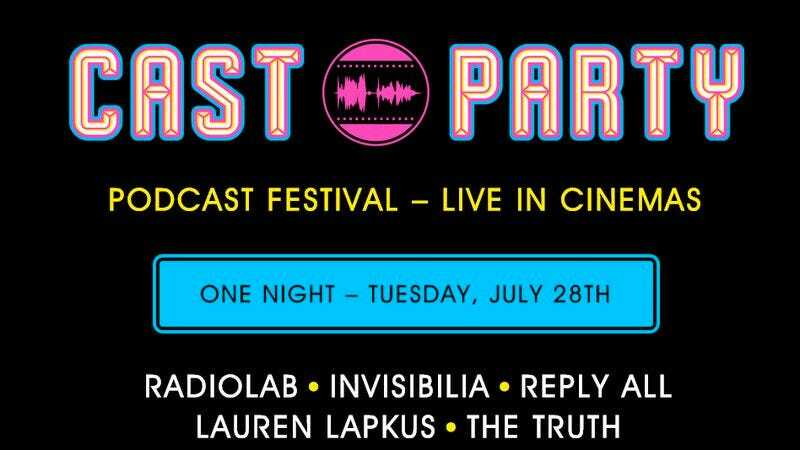 Cast Party, a New York-based podcast festival, is happening July 28 at NYU’s Skirball Center, and will be simultaneously beamed to hundreds of movie theaters across the country. Cast Party promises stories and appearances from Radiolab’s Jad Abumrad and Robert Krulwich, Invisibilia’s Lulu Miller, Reply All’s PJ Vogt and Alex Goldman, and the audio drama The Truth, as a special improvised episode of With Special Guest Lauren Lapkus. Horn quartet The Westerlies and the Cocoon Center Dance Team will also contribute, and the whole show is being produced by Seth Lind, another name that should be familiar to podcast listeners. The announcement as to what theaters will be screening Cast Party should come around June 12, but eager beavers can enter to win a pair of free tickets to their local cinema’s showing via the Cast Party site. Tickets are also still available to the actual show, should any New Yorkers be itching for some live podcastin’.